A new sign outside the high school shows school pride. 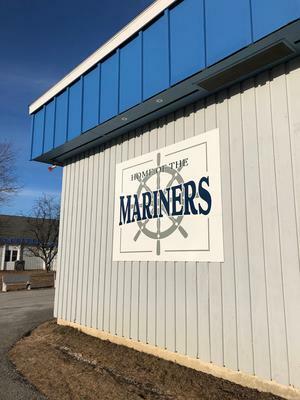 As residents of Deer Isle and Stonington get ready to weigh in on plans for the future of the island schools, here are some facts and figures to consider. All information has been pulled from the 29-page Future of Our Schools Committee Report, which can be found in its entirety at su76.org/our-schools/csd-13 or either the elementary or high school websites. Last public meeting: Saturday, January 26 at 9 a.m. at the High School. Referendum vote: Voting will take place at both Deer Isle and Stonington town halls from 8 a.m. to 8 p.m. on Tuesday, January 29. Absentee ballots are available. The following initiatives meant to provide additional learning opportunities for island students are being considered or are under way, with work continuing should the high school be kept open. • Curriculum Development Committee—a committee of school staff and community to develop high school curriculum that addresses gaps in programming and increases student interest. • Alternative Education Program—Will provide students with opportunities to meet required proficiencies for graduation by completing community service, internships, job shadows, mentoring projects and integrated coursework. • Sister School Relationship— forming a relationship with an area high school where DISHS students would be able to take classes taught by their teachers via live-stream video (and vice versa) in real time without leaving the school. • Long Distance Learning— Expanding online learning options for 2019-2020. Students will be assigned to work with staff who will support learning in this format. • Community Partnerships— The high school principal is investigating enrichment opportunities. These could start in the spring of 2019 and offer learning opportunities for credit. • Host a Hancock County Technical Center Satellite Program— Mount Desert Island H.S. hosts a Hancock County Technical Center (HCTC) Marine Service Technology program which teaches technical knowledge and skills needed to repair and maintain a boat, enter the marine trades, and pursue certification and degrees in fields including wooden and composite boat building and marine systems and design. Implementation of this option could take place in 2021. According to information provided in the FOOS report, the committee received strong public sentiment for keeping the high school on the island and came up with two viable options resulting in two questions to come before voters. Explanatory Note for Article 1: The School Board seeks advisory voter input on whether to close the high school or keep it open. ❏ I advise the School Board to close the high school and send students off island. ❏ I advise the School Board to keep the high school open. Explanatory Note for Article 2: If the high school remains open, the School Board intends to develop a plan to upgrade and remodel both buildings. The School Board seeks advisory voter input on two different options. Either option would need to be submitted back to the voters for funding approval. ❏ If the high school remains open, I advise the School Board to continue to keep separate school buildings for elementary and high school. ❏ If the high school remains open, I advise the School Board to move some high school academic programming to the elementary building but to retain the present high school gym and shop wings. The following options and associated costs, as presented in the Future of our Schools report, correspond to the choices in Article 2. • Consolidating most academic classes in the ES. • Completing minor renovations in the ES made to accommodate academic needs. • Keeping the front lobby, gym, cafeteria, kitchen, restrooms, Industrial Arts wing, two classrooms, Marine Trades, Superintendent’s office, parking and athletic fields at the HS. • Demolishing the office wing (with senior benches) and academic wing of the HS and replace with parking and/or lawn area. • Funding ongoing needs for these facilities and grounds, including the HS athletic fields. • Capital improvement needs $1,356,741. • Estimated annual operations and maintenance (Based on 2018-19 budget) $400,815.